The same structure can be used for question two. You may also opt for addressing both scenarios simultaneously. 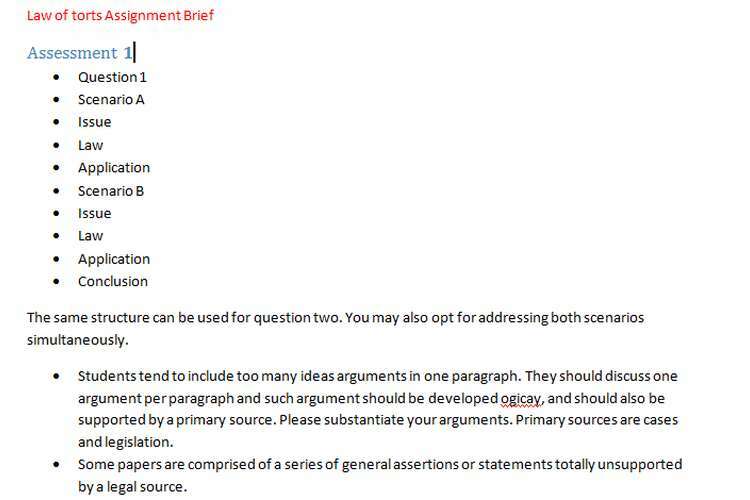 Students tend to include too many ideas arguments in one paragraph. They should discuss one argument per paragraph and such argument should be developed logicay, and should also be supported by a primary source. Please substantiate your arguments. Primary sources are cases and legislation. Some papers are comprised of a series of general assertions or statements totally unsupported by a legal source. Instead of using primary sources (cases and legislation), some students use comments extracted from the textbook to support their arguments. They also cite the book as law. when in fact students were taught during the first two weeks of the semester that the textbook is only a secondary source. If you cannot find primary sources, then it is best to cite the book rather than nothing. Not referencing your authorities may be considered as plagiarism. Some students fail to refer to the Civil Liability Act and its relevant provisions. While others refer to the Act wi a very vague way. And without pinpointing its relevant sections or subsections. There is no need to copy a whole section either. You can summaries its content wasted and insert the respective reference to it inside brackets. Students need to understand that although some of the provisions of the Civil law Act are a re-statement of the common law, cases are still important and must be used in a persuasive way. These two sources of law should be used together. If you are dealing with a case scenario, please do not stretch the facts. Work only with the facts that you have been given. Do not discuss the facts of any case. When making reference to some case law, several students explain the facts of these cases instead of using their rationes only. Remember that the ratio of a case Is the only binding part of the case. It Is the reason for the decision. It is not recommended that students copy the questions to their papers Think about the word limit. Read the marking guide carefully before starting the drafting process. You must also read the Style Guide and the Presentation Guidelines contained in the Subject Outline. It is preferable for students to use cases discussed by the textbook and the lecture notes rather than cases found somewhere else. Students may inadvertently assume the ask those cases, which were not discussed during class. may not be entirely relevant to their scenarios, or these may lack judicial strength as precedents. Proof read your paper before submitting it. Please feel free to contact your lecturer should you require further clarification on this task. This law assignment must be submitted both via Tuition and as a hardcopy. It is recommended that your name, student ID and page number are included in the header or footer of every page of the assignment. Further details about submission in Tuition are provided in Appendix 1. Please do not consider the Competition and Consumer Act 2010 or the Sales of Goods Act 1Q23 (NSW) in answering these questions, as we have not yet covered that topic. Only refer to the topic content we have studied so far. Please be advised that the word limit of 2,000 words is a total for both questions (i.e. it is not 2,000 words for each question). Please make sure to follow the Presentation Style Guide wiles. Please refer to the ‘Presentation section below. In answering these questions, the ILAC model must be followed. This despite the fact that there is no pedestrian path along the freeway, and several notices which read ‘Danger! Do not walk along the freeway’. As Phil and Jay walk along the freeway. Jay’s wife rings his phone. He answers it and Gloria says’ I miss you, pipit. hurry up! Jay is very distracted listening to his wife melodious voice. In the meantime, a car driven by Claire comes around a bend in the freeway. Claire takes her eyes off the road for a moment as she rummages through her handbag to locate her favorite lipstick. Her car veers to the left, but Claire is unable man oeuvre the vehicle and her car ploughs through the crash barrier and into the pedestrians, injuring Jay. Jay suffers from Osteorgenesis Imperfect (Brittle Bone syndrome) and as a result of its condition and the collision he broke three of his limbs. Because of the delay caused by the traffic accident, another driver, Cameron, is stuck in traffic. He is an electrician and because he cannot get to his next repair job of fixing the refrigerators in Lily’s restaurant, Lily has to dispose of $6,500 worth of Wagyu beef which goes bad. Advise all parties on any/all liabilities arising from these facts, citing relevant statutory and case law authority, using the ILAC format. On 20 September, Mitchell meets Pepper Salt over lunch. Pepper owns an electronic shop called Pepper*s Hot Office Solutions. Mitchell tells Pepper that be has just received a consignment of 3D printers and asks Pepper if he would be interested in buying any. Pepper says Send me some details this afternoon”. Mitchell sends a letter to Pepper in which he writes: 1 offer to sell you 50 3D printers at $ 6450 each, with delivery on 10 October”. Pepper puts a reply in the mail on 25 September which says I accept your offer. On 27 September, Mitchell telephones Pepper and says look, I’ve decided to sell the printers to my cousin. You have had long enough to think about this contract, and since I haven’t heard from you, I am revoking my ofler. Peppers letter reaches Mitchell on 29 September. Haley is Mitchells mum. She is 91 years old, partly deaf and with limited ability to read and write in English. She is accustomed to rely on her son for financial affairs. She bought a beautiful cottage in the Blue Mountains called Los locos’, She used her own funds to purchase the property with the belief, created by Mitchell, that she had to transfer a one half interest in the property to herself and the other half to Mitchell. No explanation of the effect of the documents had been given to her, she was unable to read them and she did not receive independent legal advice. Two months later, Mitchell informs Haley that he wishes to sell his interest in the prOperty. Haley is very upset as if he sells the property she may be homeless. Assume that you are Mitchell’s solicitor and that he has asked you for legal advice. Advise him as to what contractual liability, if any, he has in the above circumstances, citing relevant statute and case law authority. using the ILAC format. This assignment is designed to assess the following subject learning outcomes be able to investigate the different sources of Australian law in order to contrast these sources arid explain their significance and interrelationships when applying them to legal problems be able to demonstrate knowledge of tort and contract law by identifying the relevant issue(s) arising out of novel factual situations, stating the relevant legal principles, and explaining how these relate to the legal issue(s), in addition to suggesting potential remedies when providing a conclusion.your ability to conduct basic legal research.